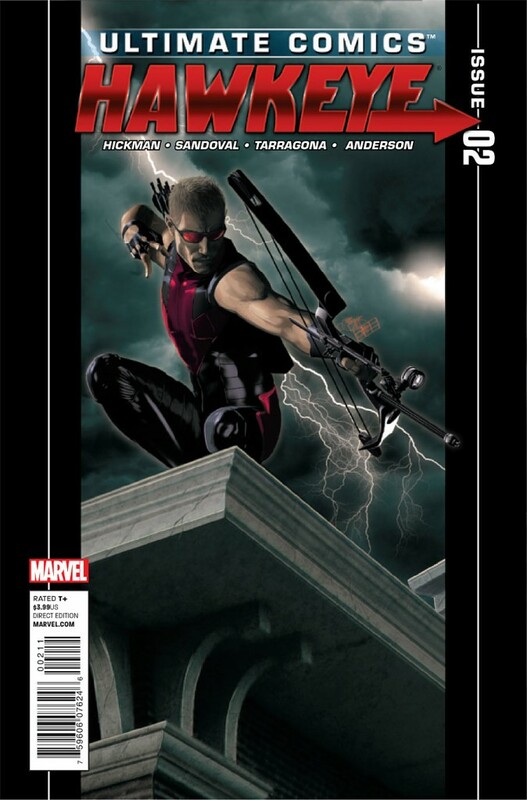 Hot on the heels and hot off the presses of issue #1 comes Ultimate Comics: Hawkeye #2, continuing the previous issue’s solo story by tying in what uber-archer Clint Barton has been up to with Nick Fury’s scrambling attempt to save a fraying world over in Ultimate Comics: Ultimates, Hawkeye’s sister title. The second of a four-issue series, we see Clint still in Southeastern Asia, trying to locate and neutralize the threat of a mutant-killing virus while tracking down remnants of the Super Soldier Serum, all while ducking local hostile forces and a renegade group of super-nationalists called The People. As dumb luck would have it, Hawkeye’s out of his league against these heavyweights and doesn’t have the luxury of calling in the Ultimates cavalry, leaving him only half a quiver and small unit of SHIELD grunts to execute Fury’s mission directive: to soldier-up and secure the formula at all costs, a task that involves toting two VIPs through a ravaged city-wide demilitarized zone en route to a SHIELD sanctioned safe house. The story paces well, plenty of action as expected. As a recreational archer myself, I’m biased: I want Hawkeye handled with plenty of self-assured tough guy badassitude representative of my sport; writer Hickman serves up just that as he reveals via a flashback that the man is a dead shot with projectile weapons, and everything’s a projectile weapon, thanks to genetically-gifted superhuman sight (if that makes him a mutant, it isn’t touched on.) Sandoval’s pencils are adept at capturing the action and tenseness of the situation – there’s a nod to the famous Tiananmen Square tank stand-off – but in some panels Hawkeye’s physique comes off less Clint Barton and more a bulky exaggeration of Captain America, a design I didn’t particularly care for. If there’s any modeling after actor Jeremy Renner, Hawkeye in next year’s Avengers flick, it isn’t here. Still, the issue – as well as the whole series to be honest – warrants a look by those digging a more gritty, military-inspired break from the regular Marvel U’s offering, the kind of Hawkeye that’s more likely to put an arrow through your eye socket than to bring you in alive courtesy of some trick arrow. The end of the book hints at issue 3’s super-sized guest star that looks to turn an awful situation hellish by comparison, so *wink wink*, there’s the teaser for October’s release. Issue 2 shapes the story up and provides a gateway into Marvel’s Ultimates relaunch for sure. Although it has nothing to do with the issue, of note is small but moving inclusion of Marvel’s tribute to the September 11th victims in case you missed it the first go ‘round. Verdict: 4 out of 5 stars. 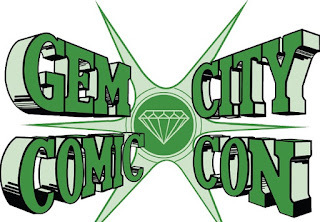 Brian Cee Williams is a contributing writer at Champion City Comics. Check out his blog at anotherbaldwhiteguy.blogspot.com .